ONE I've been coveting these booties for months and they are finally one sale, but still pretty damn expensive. Sigh. // TWO We're hosting our first Thanksgiving this year, and I think a new set of napkins are in order for the special occasion. // THREE This thick moisturizer has become my new go-to in this cold weather. // FOUR Cocktail mixers in cute packaging? Sold. Plus, they are made in Charleston S.C. // FIVE I'm stocking up on cozy knits this season, and this Theory sweater is at the top of the list. // SIX A classic camel coat is high on my wish list. // SEVEN Stay warm in an infinity scarf. 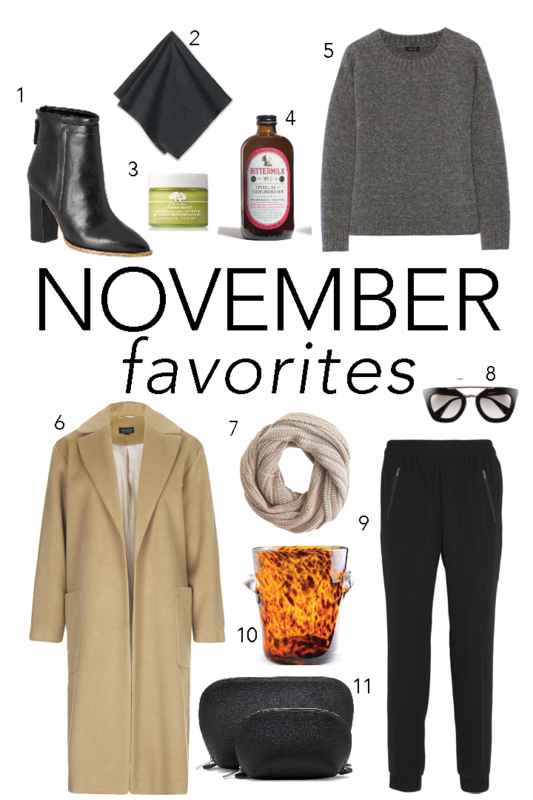 // EIGHT A girl can dream... // NINE Make your sweatpants appropriate outside of the house. // TEN Be prepared for the holidays with this charming ice bucket. // ELEVEN Traveling for the holidays? Make packing easy with this leather travel case set.